Our second conversation from 'Next Up: The LA River' is with Marissa Christiansen, Senior Policy Director of Friends of the Los Angeles River. FOLAR, as the non-profit is known, turned 30 this year, and was founded on the mission to "protect and restore the natural and historic heritage of the Los Angeles river and its riparian habitat through inclusive planning, education and wise stewardship." Its role in much of the river's discourse has often included reminding all parties involved that the river is indeed a natural river, and host to a diverse ecosystem—despite its characterization as the "world's largest storm drain" ever since the Army Corps of Engineers paved most of it for flood control in the 1930s. Christiansen trained as an urban planner before joining FOLAR this year, and spoke with Nicholas Korody about the organization's history within the river's redevelopment, its focus on reconnecting people with the river's immense natural resources, and the delicate balance between conservation, revitalization and gentrification. iTunes: Click here to listen, and click the "Subscribe" button below the logo to automatically download new episodes. When Frank Gehry's office was first attached to the L.A. River's master plan and redevelopment, the river began attracting fresh attention over a project that had already been evolving for decades. 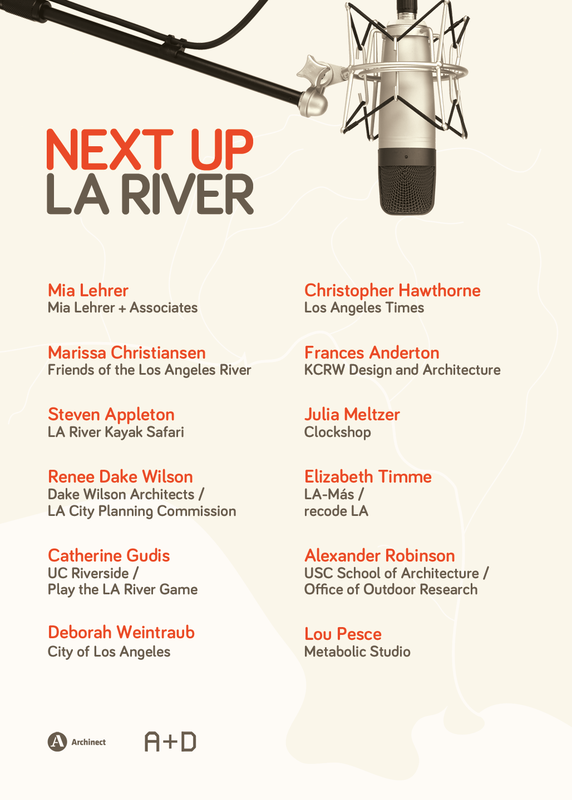 This October, in an attempt to do justice to the river's complexity and history (and the accompanying urbanist discourse), Archinect hosted 'Next Up: The LA River'—a live podcasting interview series with an array of architects, planners, artists, and journalists with varying perspectives on the subject. We're now eager to share those conversations with everyone as eight Mini-Sessions, released as part of our Archinect Sessions podcast. Myself, Paul Petrunia and Nicholas Korody moderated the conversations, which took place at the Los Angeles Architecture + Design Museum on October 29, 2016. While we reached out to them, unfortunately no representatives from Gehry's office were able to take part.